Noctua's NH-D15S and NH-C14S are the newest premium quality, quiet CPU coolers with 140mm fans. 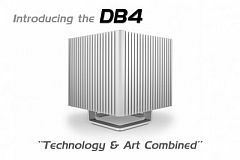 The NH-D15S is a high-compatibility single fan version of the elite-class dual tower NH-D15. 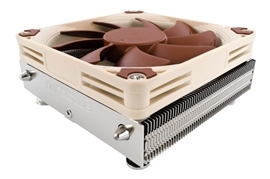 The NH-C14S replaces the top-flow cooler NH-C14. Both the NH-D15S and NH-C14S feature an asymmetrical layout in order to avoid blocking the top PCIe slot. 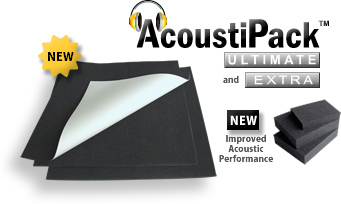 Quiet your PC using the best computer case acoustic insulation materials available - AcoustiPack™ Soundproofing. AcoustiPack™ PC and Server Acoustic Soundproofing Material Kits are the perfect solution to quiet your PC enclosure at home or in the office. High quality special soundproof acoustic barrier and acoustic foam lining materials. Excellent choice for multimedia and audio PCs for the highest level of noise reduction and sound dampening. Quiet PC USA supplies the best of quiet computer components available. You can decrease computer noise in your current system or build a new quiet computer by carefully selecting quality quiet hardware parts paying special attention to the power supply (PSU), PC cooling fan(s), CPU cooler, computer case, video card cooler and hard disk drive (HDD) with the addition of AcoustiPack™ acoustic insulation for noise elimination, and Acousti Products anti-vibration products for fans and cases. The XRackPro2 is a quiet rackmount enclosure cabinet specifically designed for noise reduction and mobility. Rackmount computer servers and RAID storage become whisper quiet in this rolling rack system. The XRackPro2quiet rackmount cabinet is also a great solution for video, audio or any other rackmount equipment that can benefit from a reduction in noise and increased mobility. NoFan silent computer products are now available at Quiet PC USA. Use the NoFan fanless CPU coolers, NoFan fanless power supply, NoFan computer cases and other NoFan accessories to build your silent and fanless system. Check out the Nofan CR-80EH fanless CPU cooler and the NoFan CS-80 ATX Quiet Computer Case. Streacom DA2 ITX Aluminum Case -NEW! Streacom BC1 Open Benchtable - NEW! Quiet PC USA stocks quiet computer hardware upgrades for home, business, research, and educational facilities! The hardware listed on this site is ideal for multimedia computers used to play CD's, watch DVD movies, home entertainment and gaming systems, television, music, audio and video production, theaters, recording studios, radio stations, ham radio operators, customer service applications, word processing, programming, design work, for computers left on for long periods of time, schools, reception areas and retail establishments ... anywhere you need a Quiet PC!